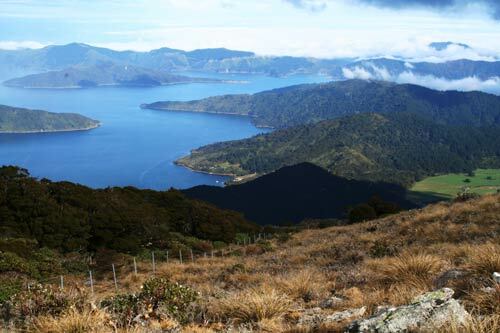 Mt Stokes (1,203 metres) is the highest point in the Marlborough Sounds. Subalpine vegetation is found near its summit, as shown in this image. This view looks down from Mt Stokes into Endeavour Inlet, with the main channel of Queen Charlotte Sound behind it, and Arapawa Island at the top of the image. Around 1954 I was staying at Shalcresses resort in Providence Bay near Endeavour Inlet along with Jack Brough and his wife from New Plymouth, who owned a sawmill between Waitara and New Plymouth, right on the Hawera turn off. During the day Mr Brough and I were seperated, as he did not show up at our pre-arranged spot while hunting. I was about 18 at the time. I eventuately got lost on a Peninsular. I slid over a cliff and my dogs followed, but we were cut off from walking around the water as the headlands came right down to the water. In the morning a large yawl appeared and I kept firing three rounds off at short intervills when the yacht turned around came in to the small cove and lowered a tender to pick the dogs and myself. The owner, Brian todd and the president of Caltex oil were aboard, and after a great meal I took them pig hunting up a valley and was very successfull filling up their kitchen. They took me back to ships cove and the resort. Jack Brough had had a heart attack.